Easy! Just call us for quote! 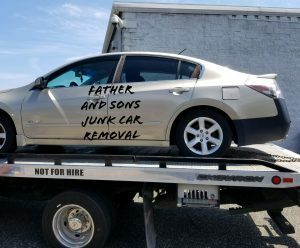 929-454-JUNK We are the Suffolk County Junk Car Removal Specialists. Do you remove vehicles other than cars? Yes! We remove ANY motor vehicles from two wheeled motorcycles to ten wheeled trucks. Can you pick up my vehicle off the highway? It depends, give us a call and we will try our best. While we enjoy recycling junk cars, we cannot pick up abandoned cars without proof of ownership. We specialize in servicing Suffolk County, New York. If you are outside this area, we can recommend a reputable, high paying vendor, like ourselves. How quickly will you pick up my junk car? Once we agree on an offer, most cars are picked up the same day. We are local and fast! Do I need to be there when you pick up my junk car? We can accommodate your schedule, or make arrangements that meet your needs, but we typically like to pay you on the spot when we pick up. Does the car need to be “roadworthy” or “driveable”? No, but please let us know in advance if has any flats, is missing tires, or has other body damage so we can be ready. Absolutely! We will email you a receipt once your car has been picked up. Do I need a title in order for you to pick up my junk car? No, as long as you can provide your driver’s license, we’ll help you fill out a DMV form (MV-35). Does it need a current inspection or registration? No, we can still process your junk car removal needs. We will make every effort to offer you the BEST price. Give us a call and let us know your best offer and we will try our best to beat it. We want you to be satisfied and recommend us to others.